One of the best ways to make money online is to have your own product. While it may seem like a daunting task to develop and launch your own product, I’ve discovered that virtually anyone can have a successful information product if they know the formula! This ebook will take you through the niche selection process and show you how to choose a profitable topic for your information product. It gives you a step by step plan for creating your information product and launching it on the Internet… all within 30 days! If you want to have your own online business up and running within 30 days, please download this ebook today. It is a 56-page PDF file, and you can download it immediately. 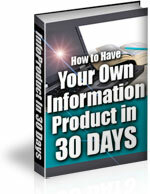 “How to Have Your Own Information Product in 30 Days“. Regular Price $47 Only $17 Today! Regular Price $97 Only $37 Today! After clicking the order button, you will be directed to ClickBank. They are a trusted online retailer specializing in digitally delivered products. After completing your order you will be brought back to EricsTips.com to download the product.